At Pattern Paving Products we put our customers front and center. For over 15 years, we have provided excellent products and support to customers around the world. Because we do everything in house from our facilities in South Carolina, you can count on us for high-quality, competitively priced products and exceptionally quick delivery. Most important, our team of knowledgeable and friendly experts is always on hand to answer your questions and assist with product selection, design templates and installation. Many of our people have been involved in the decorative asphalt industry since it began in the early 1990s. 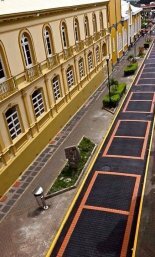 Our commitment to customers continues as we work to develop new and better decorative paving solutions.